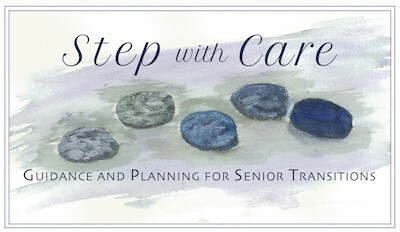 I am thrilled to announce the launch of my business, Step with Care LLC, providing customized recommendations and a range of services to individuals transitioning to independent living communities, assisted living communities, or skilled nursing facilities in the Greater Boston area. The attached flyer provides more details and summarizes the services available. I am passionate about this field, and excited about providing both objective evaluation of residential options for seniors as well as support during their transitions. For some, moving a loved one happens quickly as a result of a health emergency, and in other cases, there’s time for more planning. Based on my own experiences and what many friends have described, this is often a stressful time for family members who are trying to learn all there is to know about residential communities, while managing the needs of an ill or older relative. Involving someone outside the family can lessen some of the demands on your time, the stress level, and the feelings of being overwhelmed. At each step in the process, I provide guidance and organization as seniors and families evaluate their options and then take action to implement their plans. There are many senior communities in the Greater Boston area, and I have visited quite a few as I continue to expand my knowledge of what’s available locally. I have completed my Certified Senior Advisor® training, which focused on key health, social, and financial factors important to older adults. After 15 years as a project manager, consultant, and researcher in the work/life field, I am now applying my skills to a business that addresses the growing need for services that support our aging population. If you or someone you know needs my help at any or all stages of the process of moving an older or ill relative into a senior living community, please contact me. Or if you will soon be planning a senior’s move, consider starting preparations now. I’ll share the most relevant information and resources with you so together we can identify the safest and most appropriate residential setting for your loved one, plan for his or her transition, and then, as smoothly as possible, make that plan a reality.